Greek Ninja is no longer available online. This page is kept around for archival reasons and does not appear in our main index. "Following Sasha on an unpredictable journey of discovery... driven by fate"
A young ninja living in Greece finds herself thrown in the middle of a war. Having lost all that mattered to her, she begins a journey to discover her fate, a journey which leads to another journey, this time in the far orient. She makes precious friends on the way and, for the first time, connects with people. 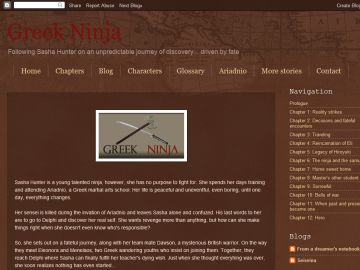 The thing that initially drew me to "Greek Ninja" was the title. I was interested in seeing how a story entilted like that would work out and I must say, although it wasn't what I was expecting to read, I was more than pleasantly surprised. Greek Ninja has not been recommended yet.